Since ages, we have been following various religious rituals or totems unconditionally. These rituals have been passed on from generations and been followed religiously, till today. These totems are believed to bring success and prosperity in all spheres of our life. There is a thin line between faith and superstition. These rituals which constitute an important aspect of our culture and daily life have lost their real significance in the course of time. The reason is our way of approaching life. In today’s fast life we want quick fix solution for every problem. The advancement in science and technology has made our living easy but it has also made us dependent and intolerant. We seem to take life as tool that will give us quick results. Therefore, when faced with a challenge we immediately run to the priest or an astrologer for an easy rescue. Do we ever ask questions that why we should follow such rituals or totems? We either term them superstition or we blindly follow them. Did we ever try to understand the logic and purpose behind such totems? Or why they have come to existence and are still prevalent in our society? The new book, “Über KARMA: The Sixth Sense” by Rajnish Talwar explains the logic and purpose behind such rituals and totems. The book explains the scientific significance of the totems that were developed thousands of years ago by the learned men or “Rishis”. The book breaks many myths pertaining to totems by putting forth the relevant symbolical and logical explanations. “Über KARMA: The Sixth Sense will open a way to all those encapsulated secrets of life, our existence in the Universe and our role in this Universe which starts from within. It will inspire you to move ahead in your life with passion, dedication and commitment”. Rajnish Talwar is an Über Karmaic, Reiki Master, clairvoyant, German Linguist and a contemplative artist. In spite of his decade long flourishing corporate career, Rajnish always had searched for deeper meaning of life and found the key of life. His art expresses the seeming paradox of stillness within the movement. As a contemplative artist, his painting expresses the intricate connection between the conscious and subconscious mind. Rajnish develops his concepts by transforming mundane experience into a parallel reality through his vision and imagination. Rajnish has a deep connection with the Gaia - the goddess of Earth and for him life is like a Tree which is present since eternity and will remain till eternity. 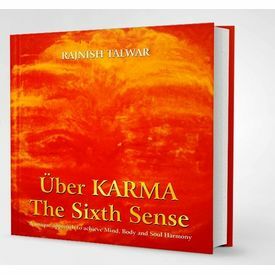 Über Karma The Sixth Sense By Rajnish Talwar A unique approach to achieve Mind, Body and Soul Harmony Since ages, we have been following various religious rituals or totems unconditionally. These rituals have been passed on from generations and been followed religiously, till today. These totems are believed to bring success and prosperity in all spheres of our life. There is a thin line between faith and superstition. These rituals which constitute an important aspect of our culture and daily life have lost their real significance in the course of time. The reason is our way of approaching life. In today’s fast life we want quick fix solution for every problem. The advancement in science and technology has made our living easy but it has also made us dependent and intolerant. We seem to take life as tool that will give us quick results. Therefore, when faced with a challenge we immediately run to the priest or an astrologer for an easy rescue. Do we ever ask questions that why we should follow such rituals or totems? We either term them superstition or we blindly follow them. Did we ever try to understand the logic and purpose behind such totems? Or why they have come to existence and are still prevalent in our society? The new book, “Über KARMA: The Sixth Sense” by Rajnish Talwar explains the logic and purpose behind such rituals and totems. The book explains the scientific significance of the totems that were developed thousands of years ago by the learned men or “Rishis”. The book breaks many myths pertaining to totems by putting forth the relevant symbolical and logical explanations. “Über KARMA: The Sixth Sense will open a way to all those encapsulated secrets of life, our existence in the Universe and our role in this Universe which starts from within. It will inspire you to move ahead in your life with passion, dedication and commitment”. About The Author Rajnish Talwar is an Über Karmaic, Reiki Master, clairvoyant, German Linguist and a contemplative artist. In spite of his decade long flourishing corporate career, Rajnish always had searched for deeper meaning of life and found the key of life. His art expresses the seeming paradox of stillness within the movement. As a contemplative artist, his painting expresses the intricate connection between the conscious and subconscious mind. Rajnish develops his concepts by transforming mundane experience into a parallel reality through his vision and imagination. Rajnish has a deep connection with the Gaia - the goddess of Earth and for him life is like a Tree which is present since eternity and will remain till eternity.